Add some granola and dried fruits such as currants or cranberries for added flavour. 1. Preheat the oven to 180°C/ gas mark 4. Line a baking tray with non-stick baking paper. 2. Use an apple corer to remove the seeds but don’t cut all the way through the apple to the bottom. This will prevent the nut butter from seeping out while the apples are cooking. 3. Place the nut butter, brown sugar, if using, and cinnamon in a bowl and stir to combine. Use this to fill the centre of the apples. A disposable piping bag is perfect for the job. 4. 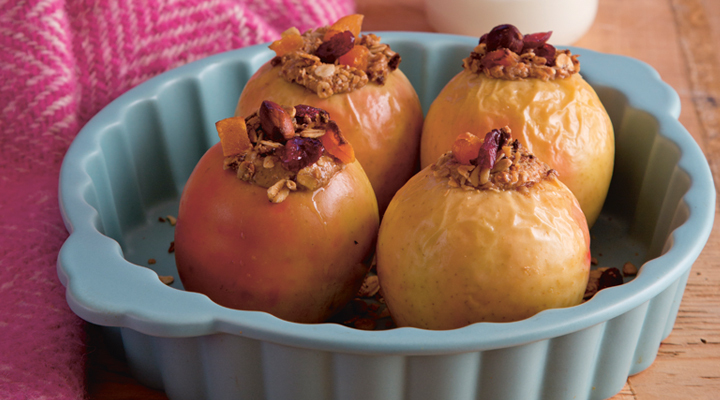 Bake in the oven for 25 to 30 minutes, until the apples are soft and heated through.